When so many ”machineguns” are made just to look like the real thing i decided to emphasize that these also function somewhat like the real thing in that they fire, but of course without using gun powder. 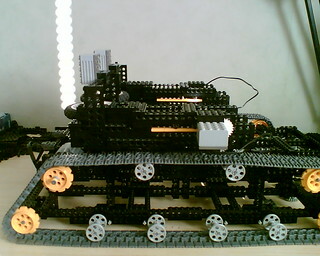 They are made from only unmodified LEGO-pieces powered by LEGO-motors and regular 9V batteries. These guns are not a new invention for me. 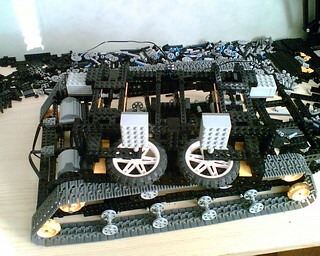 I made the first version some ten years ago but lacked camera and a place to write about it so i couldn’t tell anyone and later i noticed that The LEGO Group had used a similar system in one of their models and then i knew i couldn’t claim to be the first. Though i still believe that i was the first because when i built the first gun no design like that could be found other than my inspiration that was a Turtles pizza thrower. I don’t have any pictures of it but is used a spinning wheel to launch small plastic discs with stickers on them that made them look like pizzas. It didn’t shoot very far though and only held 6 pizzas but it sparked my imagination. The first version was a long tiled barrel with lots of gear wheels that was supposed to grip hold of gear racks put after each other but while it worked, the rack landed just in front of the gun. 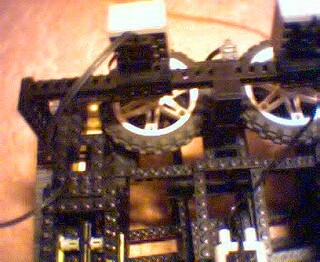 Later i added a spinning wheel and tried various sizes of wheels. To get the ammo to the wheel i soon discovered that using a cam in a similar way like in steam engines was the best way to feed ammo to the wheel. Depending on the motor used you can get a slow feed or even single round, or you could get a machinegun style firing rate. The motor used now has a 8t gear on it that drives a clutch gear. This makes a firing rate of about 800 rounds/minute. No i’m not kidding. The range is about 4-5 meters in semi auto and about 3-4 in full auto. Using these motors makes semi-auto virtually impossible but i did test the guns with a gear motor. These ranges are with 9v batteries, with 7v the range is nearly cut in half. The real life inspiration was a Gatlin gun which use gravity to feed the ammo into the gun. 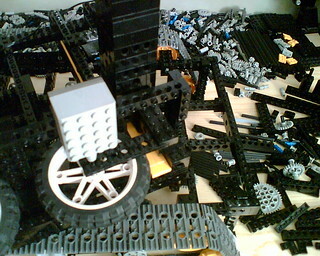 Building round shapes of LEGO-pieces is very hard so i decided not to try that design. 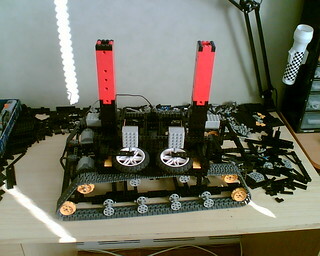 As the pictures show the magazine is rectangular and built up of lots of 1×2 and 1×4 beams, some technic, and some system. They hold 30 rounds each and in full auto it takes 2-3 seconds to empty them. Not much time for aiming. Unfortunately this version also suffers from ammo jamming but it got better after i added a follower made from 3 2×2 round beams stacked on top of each other with an axle in the middle. This is why i use a clutch gear for the feed yet the motors seem to slip anyways. I really don’t know how to stop the ammo from jamming. The obvious answer would be to make the magazines wider but then the rounds would move around and they mustn’t do that. Perhaps i should simply change ammo but that is also a hard decision to make. What would i use instead. To wrap this up i can say that i will be making improvements to this gun some time. Or maybe completely redesign it. Still i like the fact that all those guys on youtube who think that they have seen or built some really cool gun should think again and have a look here. These guns have range, firing rate and mostly also jam-free operation. As for the gun in Forbidden LEGO it isn’t that amazing compared to my guns. 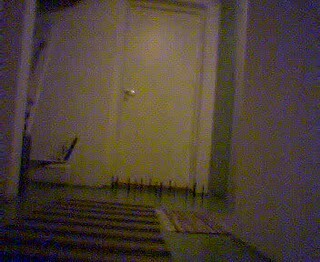 There’s no way i could fire at something as close as is done in this video . Doing so would be a really bad idea. The gun seems to be about as powerful as other rubberband powered guns. Oh well now i really must hurry to get better videos up. Maybe i should try the kitchen. Oh and speaking of videos, of course i have to show what i have so far so here they are. Sorry about the low quality, it’s only a webcam and i need more light. I’ll see about making better ones soon. This video is a closeup of a gun showing the feeding axle and the wheel. The rectangular hole is where the magazine should be. I’ll see about making a new video with better lightning. This one i’ll redo soon but is shows what happens to whatever is in front of the gun. 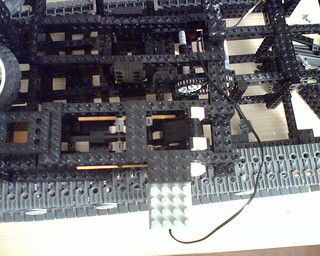 The targets are 16 16×1 technic beams placed so one falling shouldn’t strike another one. You probably wonder what the guns are mounted on and that is a tank that i never finished. I lost interest in it so i built it enough so that i could mount the guns. It can drive but not over obstacles if it has the guns on. The motors are as seen 2 front mounted Power functions XL motors. The tank would work much better with lighter weapons on it. I also planned to cover it up so that it wouldn’t look so hollow but i never got around to it. Maybe one day i’ll make another one but for now i’ve got other things planned. There is a cad-image made in MLcad that contains all parts that make up the gun. It took many hours to make and i am aware that several pieces don’t align properly, but i don’t feel like fixing it. I find it really hard to make cad-models but at least you can see more clearly how the gun looks. I will be updating this design when i got the time.